The Norwegian University of Science and Technology (NTNU) in Trondheim started doing research and courses on brewer's yeast a little over a year ago. I figured this was good timing, and asked them if they wanted to do research on kveik (Norwegian farmhouse yeast). The answer from professor Per Bruheim was immediate. Yes! They would love to have some Norwegian yeast to work on. So I've been sending them all the yeast I could get my hands on. This spring the first fruits of their research emerged: the thesis "Characterization of genotype and beer fermentation properties of Norwegian Farmhouse Ale Yeasts", by Truls Rasmussen. It's a master's thesis where Truls has looked at the various collected yeasts from several points of view. The whole thing is 164 pages of quite intensely technical biochemical detail, but I'll try to explain the highlights here. I guess many people don't know all of these yeasts, so I'll give a quick overview here so that you can refer back here and get a sense for which yeasts are which. I use the names used in the thesis here for simplicity. I'm listing these by geographic origin south-to-north order along the Norwegian west coast. Sigmund, the first kveik I ever met, from Voss. The story of brewing with Sigmund and collecting his yeast. Commercially available from The Yeast Bay and Fermentum Mobile. Rivenes, also from Voss, collected a few years before. Wendelbo, from Lærdal. I'm told this yeast has been used since forever in the valley. I have not yet met the brewers, unfortunately. Muri, from Olden. This yeast was apparently last used in the 1990s and then left in a storehouse on the farm. Andreas Muri is a modern homebrewer, and in 2015 got the idea of trying to revive the yeast, which he managed to do. It's been sold commercially as WLP 6788. Raftevold, from Hornindal. The story of me brewing with this yeast. Gausemel, also from Hornindal. Terje Raftevold got his yeast from Olav Sverre Gausemel 20 years ago, so these are almost the same. I've met Olav Sverre briefly. Stranda. Stein Langlo in Stranda had stopped brewing with this kveik, and NCYC just barely got it to grow. Back story. Sold commercially as OYL-057. Some people have been skeptical of this whole kveik story, claiming that no way can people have kept these yeasts going for centuries, and that most likely this is normal bread yeast like the farmhouse brewers use in regions where there is no kveik. To check that, Truls included Idun Blå, the Norwegian commercial bread yeast. Finally, Finland 1 is a yeast that Mika Laitinen collected from a very old sourdough culture from the sahti area in Finland. He brewed with it a few times and eventually got a yeast that produces something not unlike modern sahti. Whether it was ever used to brew sahti for real we don't know. The yeasts referred to as Lithuania 1-4 were collected from Lithuania by me, but since I didn't manage to get permission from the brewers to do research on them we've anonymized the results. Don't bother asking me which yeasts they are, because I won't tell you. Not before I can get permission from the brewers, which may never be forthcoming. Overall, a pretty diverse bunch. Most of these yeast cultures contain more than one strain of yeast. Sigmund's has 3, Rivenes's has 7, Hornindal has 8, Muri has 2, and so on. The only one that I know has just one is Stranda. The thesis ignores this, which makes interpreting the results a little harder. We know that for example in the Hornindal and Gausemel kveiks there are strains which are not related to one another at all. So it's possible that if they'd picked other strains from within these cultures they would have gotten different results. The first feedback I got was pretty immediate. Per wrote back saying "there are contaminants in these cultures!" It turned out there were bacteria in the Hornindal kveik, but I already knew that these bacteria were supposed to be there. So I wrote back telling Per not to worry, and to make sure to test with the bacteria. From the photos I can see why Per and Truls were worried. The bacteria produce a yellowish glassy slime that really doesn't look very good. The taste is amazing, though. These were pretty similar. 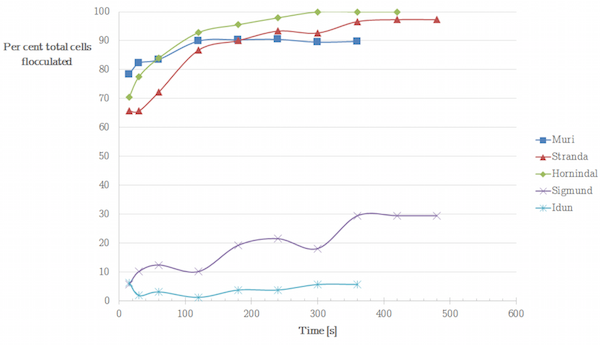 Sigmund's Voss kveik was the fastest, a finding that will not surprise the many people who have seen this yeast overflowing their Erlenmeyer flasks when growing it. The slowest was Stranda. Total variation was about 20%, so not huge. They tested how well the yeasts flocculate, that is, how fast they settle down to the bottom after fermentation. Hornindal flocculates like a real hero, with 100% of cells settling out within 5 minutes, and Stranda and Muri also perform pretty well. As we found in our own tests, the Idun Blå commercial bread yeast is a really crappy flocculator, with about 5% having settled out after 5 minutes. More surprising was that they found that Sigmund's Voss kveik also flocculated poorly (30%). I've watched that literally settle out while I was looking at it, so how they got this result I really don't know. The odd thing is that other people have been getting the same result. Sigmund's kveik consists of at least three related strains, and it's possible that one of these is a poor flocculator. It may be that NTNU grew that one, while normally it's not dominant. Perhaps. The first thing we see from the diagram is that the Lærdal kveik (Wendelboe) is an outlier. All the other yeasts are more closely related to each other than they are to that one. So that yeast is a real oddity. Next, the yeasts split into two groups. A small group of three: Terje Raftevold's Hornindal yeast, Olav Sverre Gausemel's yeast also from Hornindal, and Svein Rivenes's from Voss. Terje got his kveik from Olav Sverre 20 years ago, so it makes perfect sense that these two should be close. They're very nearly the same yeast. Svein Rivenes's probably shouldn't be here, though, since we already know that it's very closely related to Sigmund's. The other group has one outlier: Idun Blå. The rest are more closely related to each other than to that one. 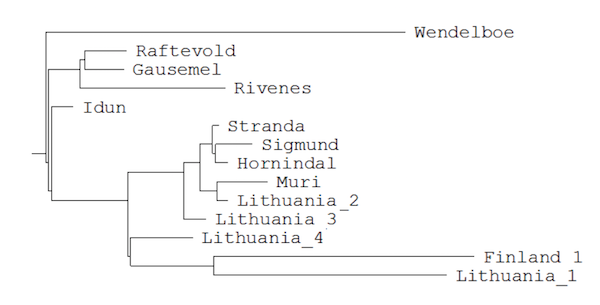 The group is further split into two, one smaller group (Lithuania 1, Finland 1, Lithuania 4), and a bigger group (Stranda, Sigmund, Hornindal, Muri, Lithuania 2 and 3). Stranda, Sigmund, and Horninal form a small cluster. So ... what does this actually mean? Well, most of all it means that these yeasts are extremely diverse, and that the yeasts don't cluster by what region they came from. A Finnish yeast sits in between the Lithuanian ones, and some Lithuanian ones are closer to some Norwegian ones than to the others. Even within Norway the geographical relationships don't hold. Stranda, furthest north, is the most similar to a yeast from Voss, furthest south. That fits well with what I've seen after this study began. William Holden collected two kveiks from Stordal in Sunnmøre. It's a very small village (population 1020), so you'd expect it to have no more than a single yeast strain, but the two cultures produce dramatically different beers. They don't seem to be related at all. Truls also uploaded the genetic sequences to an online tool that from the genetic data predicts what species it is. In general, if the answer has a certainty of less than 80%, you should consider the species unknown. Curiously, the tool can't determine the species of no less than four of the yeasts. We'll get back to what that might mean. People have assumed that farmhouse yeast is normal ale yeast (Saccharomyces cerevisiae), but that's not what these results show. Only four of the yeasts are identified as ale yeast. A fifth (Sigmund) is tentatively identified as ale yeast, but it's uncertain. Let's walk through the various exceptions and discuss them a little. The next surprise is that no less than three yeasts are identified as Saccharomyces boulardii, and one additional uncertain identification (Rivenes). Note that Rivenes's closest known relative, Sigmund, is an uncertain Saccharomyces cerevisiae identification. S. boulardii is a tropical yeast that's very closely related to ale yeast. It seems deeply unlikely that a tropical species should exist in the wild in Norway and Lithuania, but could it be that these farmhouse yeasts are a variant of S. cerevisiae that shares some high temperature tolerance genes with S. boulardii? This is just me guessing, but it doesn't seem impossible. One also has to wonder whether these S. boulardii-identified yeasts might be a new species. Unfortunately, that's probably going to be a very difficult question to answer with any certainty. Wendelboe is identified as Saccharomyces cariocanus, which is a little-described species in the same family. It seems to be closely related to the better-known Saccharomyces paradoxus, which is a close relative of normal ale yeast. However, the confidence level here is 24%, which basically means we have no idea what this actually is. It's probably a Saccharomyces yeast, though. The Finnish yeast is identified as Candida humilis, which is interesting, because that species is known to be used in sourdough, which is where it came from. I don't know enough about this species to say whether it's normal for it to be able to ferment alcohol up to reasonable beer strength. Finally, one of the Lithuanian yeasts is identified as Candida suzukii. This species is barely decribed at all that I can find, and in any case the confidence level on this one is 6%, which essentially amounts to the database throwing up its hands and saying "I give up!" So what this really is is still a mystery. We've learned a few things from this thesis. For one thing, kveik is not a type of yeast. All ale yeast is Saccharomyces cerevisiae, but the kveik appears to range more widely than that. This fits perfectly well with earlier brewing experiments with kveik, and with the history of this type of yeast. There's no reason why these yeasts should all be closely related, and it turns out they're not. Another thing we've learned is that these yeasts are not merely bread yeast. And quite frankly, there's no reason why they should be. People managed to keep their yeast strains going for centuries (probably millennia) until the arrival of pure yeast culture technology in the 1880s. Of course they could keep doing the same in the mere 130 years until the present day, even if nearly everyone else switched to pure yeast cultures. Thanks to professor Per Bruheim and Richard Preiss for reading over the text to help me weed out errors. @WH: Thank you for telling me! Corrected now. Perhaps Sigmund's kviek falls out well because of the huge flocs they form - the analysis might have used one of these flocculation machines which spins the sample with a small agitator paddle? * maybe the flocs were dispersed into smaller sizes. I have seen the same as you with some reviews though (I plan on picking this up soon). Out of interest I saw this yeast was advertised on a forum for a source of bakers yeast for brewing Sahti, do you have any experience? I just picked some up. The other thing I've seen are labs like white labs use imhoff cones to test flocculation characteristics. @WH: You can find the method details in the paper, but I would be surprised if their methodology was flawed. I've watched that yeast flocculate in a glass, and basically the glass clears while you're looking at it. I was totally shocked. Later I saw two different lab technicians comment on the same thing on Milk the Funk. So it really flocculates incredibly fast. That Sunday yeast I've never heard of. I wonder how it compares with "Finland 1" and the normal baking yeast. Thanks very much for the fast responses, I'll brew some beer with it soon and update you if you want. I'm guessing it has lactobacillus in the sample as a lot baker's yeast do. I'm planning on plating it out so I'll know soon enough! suregork.com did a lengthy paper on sahti if you're interested (on the beer and the yeast), you've probably already seen it*! Unfortunately I couldn't find the type he referenced to buy online. It's going to be a long night ahead to read this paper... :) - a cursory glance and it looks like they inverted the yeast in a cylinder then measured flocculation from that (hough's method??). Awesome post, thanks for the update. Looking forward to reading this, especially the bit about the flavours :). I will comment on baker's yeast and sahti. Most sahti brewers use fresh compressed baker's yeast produced by Suomen hiiva in Lahti, Finland. That's the yeast suregork was referencing. When fermented warm, this yeast gives a hefty banana aroma apparent in many sahtis. That yeast strain is not available in dried form, and I guess it is not much exported. A minority of sahti brewers use dried baker's yeasts, but all dried yeasts on the Finnish market are produced outside of Finland. I haven't tested dried Sunnuntai yeast for fermenting sahti, but likely it would work, as would many other brands. Likely the fermentation characteristics are different for each brand, but huge variation is only natural in the farmhouse ales. Surely kveik is important part of Norwegian farmhouse ale, but to my mind it is not essential to use Finnish baker's yeast in sahti. Just pick some baker's yeast available locally. That is what the farmhouse brewers in Finland have been doing. Thanks for the comment I appreciate it, you make good points. I'm hoping to source some Suomen hiiva sometime in the future to try and compare with other brands. I'm definitely seeking that banana aroma! I'll try some local baker's yeast as you suggested, lots of mead makers use it successfully. In my search for the differences in Sahti bakers yeasts I found this website which I thought you might be interested in - lots of similarities with some of the brewers you visit! Awesome post from a very interesting blog! What a cultural, archeological and historical detective story. This study's findings just confirms the feeling that has been growing with me that Kveik is the real beer world equivalent to an Indiana Jones story. Thought you'd be interested in this paper which was just published (Chris white has been doing talks on it for a while). I wonder where cerevisiae kveik fits on the spectrum. @WH Thank you for all the info! I skimmed the Verstrepen paper yesterday, but still need to read it more carefully. Would dearly love to see how the kveiks would fit into that tree. And thank you, Mika and Sigfred. I wonder why Idun is identified as S. boulardii? I thought all baker's yeasts are S. cerevisiae. @Mika: I don't know. It's possible that it's a mistake. Lager yeast are not native to Europe. Despite much fieldwork, it hasn't been found in the wild. Asia seems to be the most likely source. The most likely explanation for the Muri strain is it was brought/taken from the continent at some point in Norway's past. Via Denmark perhaps? Out of interest, which DNA markers were used for the phylogeny? I would be interested in the raw data, if it is available. Some of the patterns reported to identify Kveik 'strains' look more like reshuffling via sporulation, probably promoted by poor handling and the associated stress. @John: No, lager yeast doesn't exist in the wild. It was created by domestication. What does exist in the wild is one of the two parents of lager yeast: Saccharomyces eubayanus. Which, as you say, has been found in Tibet. Whether it also might exist other places I don't think is known with any certainty. If I remember correctly they used the ITS subregion. This is all described in the paper, which I linked to in the blog post. You also find email addresses there, so you can write to the author and ask for the raw data. Thank you for the pointer, Lars. I assumed the dissertation was in Norwegian. After skimming the genetics sections, I suspect the DNA sequence data is more likely to fail QC. Clean, readable sequences are essential for any valid downstream analyses. Therefore, I would not recommend publishing the tree, as it stands. It is more likely a red herring confusing any interpretation. Disappointing, I know, but I hope this helps understand why the tree stands out like a sore thumb and I look forward to an English version of the book. @John: Why do you think the DNA sequence data is faulty? You may well be right, but it would be very helpful to know more than simply that you think it might be.